Head into the Wisconsin woods for an Olympic-worthy adventure. 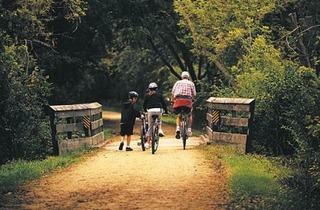 Photo: Courtesy of TravelWisconsin.com HAPPY TRAILS Breathe in that fresh air as you pedal through the great outdoors. Urban cycling can be an adventure no matter what your age, thanks to roadblocks ranging from cars and potholes to dogs and pedestrians. 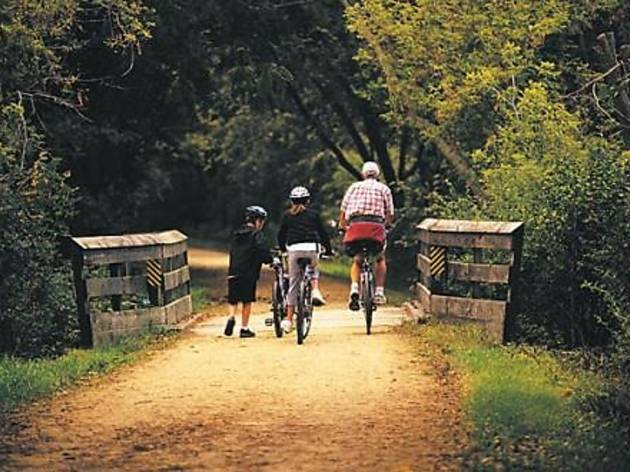 But a different kind of two-wheeled excitement is just a three-hour drive away in southern Wisconsin, near Mount Horeb, where families can hit the paved paths and dirt-road trails at Blue Mound State Park, one site proposed for cycling competitions if Chicago lands the 2016 Summer Olympics. The whole area would likely be involved in the Olympics. Time trials could be held in Madison with some mountain bike events unfolding at the nearby Tyrol Basin ski area. Several high-profile (and high-intensity) cycling events already take place in the area, including the Horribly Hilly 100, which climbs up the tortuous, legs-will-scream Mounds Park Road in the park. Beloved to mountain bikers thanks to six miles of dirt trails offering scenic views of the surrounding countryside, the 1,153-acre Blue Mound State Park is perched on the tallest hill in southern Wisconsin and offers other activities such as swimming, a nature center and shaded picnic areas. There’s a $4 per day trail-pass fee for cyclists over 16. Hiking is free. Introduce kids to off-road cycling with three dirt paths: The flattest, shortest loop—the John Minix Trail—is an easy one-mile trek over mostly hard-packed dirt and gravel. The Willow Springs Trail and the rolling Pleasure Valley Trail are two miles and pass through sugar maple trees, an open prairie and a wooded valley. These loops each take about 25 minutes, but budget extra time to take in the surrounding countryside. More serious riders may want to branch off to the steep climbs and rough terrain of the three-mile Single Track Trail. This path offers spectacular views of the dolomite and chert outcroppings and challenges bike-handling skills. All paths can be reached from the trail head at the pool parking lot, in the middle of the park. For smooth, paved riding, join up for part of the 40-mile Military Ridge State Trail, which runs along the southern border of the park. As you spin by the midsize towns of Ridgeway (known for its Folklore Village) and Barneveld (where Botham Vineyards happily offers tastings), you’ll encounter tiny towns—typically a short half mile off the trail—with shops hawking artisanal cheese. Peel off and explore—that’s half the fun! The path finally ends in Dodgeville, where you’ll find a courthouse built in 1859 as well as the award-winning Uplands Cheese Company (5023 State Rd 23, 608-935-5558, call ahead). When it’s time to put those feet up, consider staying the night at the Deer Valley Lodge near Barneveld, where rooms with bunk beds start at $159 a night (W Industrial Dr, 888-924-1601). Water babies will love cooling off in the small indoor water park (think twisty slide and hot tub). Or rough it in a tent at Blue Mound State Park ($12–$17 a night, 888-947-2757, reserveamerica.com). Armed with treats from the country and a healthy dose of exercise, you and the little ones should be recharged and ready to face the city again. But be careful, it’s a jungle out there. Ready to roll? Visit travelwisconsin.com for trail maps and directions. Rent bikes at Yellow Jersey in Madison, Wisconsin (419 State St, 608-257-7733).